How to make BB Cream at Home? BB creams hit the Asian beauty industry in late 2011 - early 2012 and since then has been a huge hit. You can call it Blemish Balm, Beblesh Balm, Blemish Base or Beauty Balm. BB Cream is basically the mixture of 6 essential beauty products - Moisturizer, Serum, primer, concealer, foundation and sun-block. The beauty product manufacturers combine these beauty products in the secret ratio to form the BB cream for different skin types. It won't be wrong to say that BB cream is a multi-tasker product for beautiful skin. According to Wikipedia, Dr. Christine Schrammek is the creator of BB cream. The BB cream came into existence in Germany in 1960. Dr. Christine was looking for the product which can take care of the skin of the people who has gone through the facial surgery. She developed the product popularly known as BB Cream especially for her patients who used it post facial surgery. Why BB Creams are hit in beauty industry? As BB Creams play a significant role of protecting your skin from harmful UV rays in addition of hiding the spots to give you the perfect moisturized glowing skin. Secondly, you don't have to worry about multiple products. It won’t be wrong to say that BB Creams are all-in-one beauty product and you are done within 2 minutes by using it. Saves time in this fast paced world. What else we need? Like any other beauty products, BB Cream should also be chosen according to your skin type and tone. If you are oily skin beauty, choose a matte touch BB Cream. Most obviously a moisturized BB cream should be chosen by the dry skin beauties. The colour of BB Cream should be one tone lighter to your skin tone. However, the problem is BB cream comes in limited shades. Finding the perfect shade according to your skin tone is really a task. Hence I am here listing down here a simple to make BB Cream at home. - Combine all the ingredients in the bowl and mix well for 5 - 10 minutes. - It should be little creamy in consistency. Else add the powder if too liquid or moisturizer if too thick. - Take small amount of BB Cream on your palm. - With the help of the fingers apply the BB Cream on your face as dots. Make sure you apply on all parts of your face viz forehead, nose, cheeks, chin, front side and back side of the ears and neck. - Blend the dots of bb cream; pat the cream with your fingertips in the circular motion to give you perfect glowing skin. Be sure to blend it in upward / outward motion. Please note, if you are darker skin toned, add a bit of foundation in the BB Cream while applying it to cover the imperfections. Make the BB Cream at home, and let us know the result via comments. 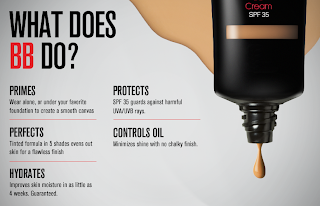 Image Source: What does BB Cream Do?